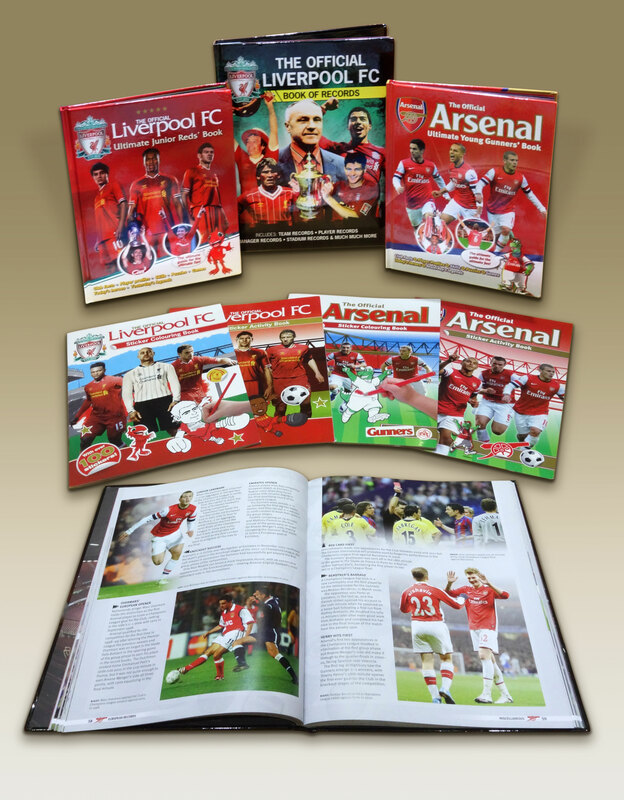 emc design has gone red with pride as Carlton Books release Arsenal and Liverpool Colouring and Sticker Activity Books as well as Official Guide & Record Books for the Premiership’s current leading clubs! We have been busy working over this last year with Carlton Publishing Group to produce and design the Activity and Sticker Books which are full of puzzles, fun games and include player profiles and club facts. As well as the activity books, we also designed the Official Ultimate Young Guides to the clubs, detailing player statistics, more club facts and many more engaging puzzles and games. emc design also produced the page layout of the Official Book of Records for the clubs, which includes all sorts of records from team and player statistics to manager and stadium records. It was a rewarding and challenging experience to work on the designs as the books have complex layouts, despite the books being aimed at children, and so the team intricately put together the content, including player positions, complex cutouts and stickers. This was done ensuring consistency of the strict brand guidelines from Arsenal and Liverpool Football Clubs. Some of our designers also had to wrestle with seeing their rival clubs (Gavin is unfortunately a Spurs fan) every day which was hard for them, but nonetheless we feel very privileged to have worked with Carlton Books on these new releases, which can be purchased here. EMC’s stunning front cover designs and page layout for Carlton Books’ latest Premiership titles.